You may not have come across consecutive sudoku puzzles before, as they are not that often seen. 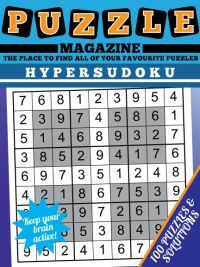 Particularly in puzzle magazines, even those that are dedicated exclusively to sudoku, you will not tend to see consecutive puzzles that often, and when you do, there are usually only a couple in each magazine. 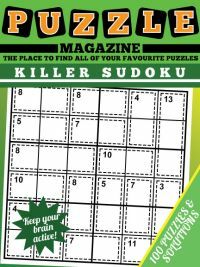 This has now changed, as the consecutive sudoku puzzle magazine available on this site is composed of nothing but consecutive sudoku: 100 of them, in fact! 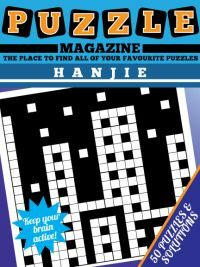 So if you enjoy this type of puzzle, then you will be spoilt for choice with this magazine. 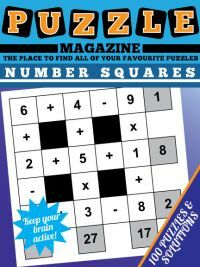 There are four puzzles per page, with all the solutions at the back, and puzzles gradually get harder as you move through the puzzle magazine. The rules of consecutive sudoku are as follows: each region of the puzzle (row, column, box) must contain 1 - 9 once. So far, the same as sudoku. However, certain cells have a grey market between them, as you can see in the image to the right. This marker tells you that those two cells contain consecutive numbers. For instance, if one of the cells contains a '1', then the other must be 2. If a cell contains 5, then the adjacent consecutive cell must be 4 or 6, and so on. This brings in some intriguing logic and interesting deductions can be made, particularly where there are chains of consecutive cells or where one cell is marked as having a consecutive value to more than one adjancent cell. As you play the puzzles in this magazine, some nice logical ways of narrowing down values may occur to you. You can take a look at a consecutive sudoku magazine page. Intrigued by the puzzle but not too sure how to play it? Then take a look at our Consecutive Sudoku Hints page first! 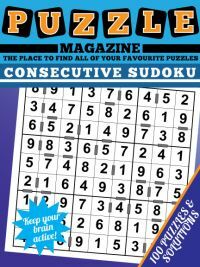 In response to several requests received for more Consecutive Sudoku puzzles, Issue 2 can be downloaded below, containing 100 more Consecutive Sudoku puzzles.